Seeger's grandson, Kitama Cahill-Jackson, says Seeger died on Monday night after being hospitalised for six days. Seeger gained fame as a member of The Weavers, the quartet formed in 1948 and had hits such as Goodnight Irene. He continued performing & recording for six decades and was still an activist as recently as October 2011 when he marched in New York City as part of the Occupy Wall Street protests. He was onstage in January 2009 for a gala Washington concert two days before Barack Obama was inaugurated. But in the 1950s, his leftist politics got him blacklisted & he was kept off commercial television for more than a decade. 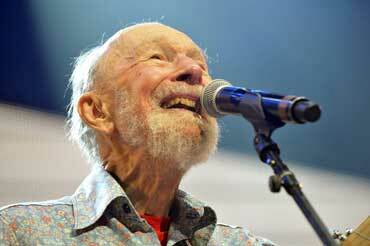 With The Weavers, Seeger helped set the stage for a national folk revival. 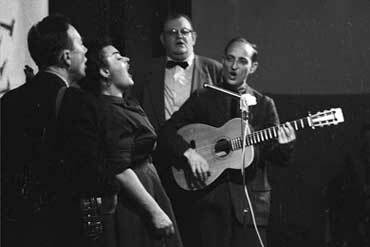 The group - Seeger, Lee Hays, Ronnie Gilbert and Fred Hellerman - churned out hit recordings of Goodnight Irene, Tzena, Tzena and On Top of Old Smokey. Seeger also was credited with popularising We Shall Overcome, which he printed in his publication People's Song, in 1948. He later said his only contribution to the anthem of the civil rights movement was changing the second word from "will" to "shall", which he said "opens up the mouth better". "The most important job I did was go from college to college to college to college, one after the other, usually small ones," he told The Associated Press in 2006. "... And I showed the kids there's a lot of great music in this country they never played on the radio." Seeger was inducted into the Rock and Roll Hall of Fame in 1996 as an early influence. 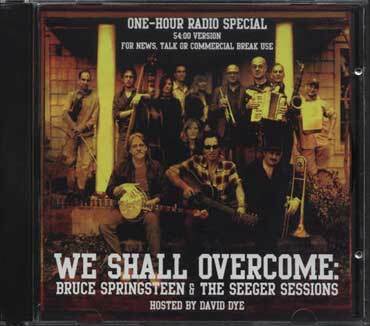 Ten years later, Bruce Springsteen honoured him with We Shall Overcome: The Seeger Sessions, a rollicking reinterpretation of songs sung by Seeger. 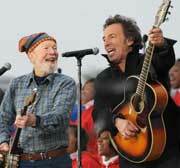 While pleased with the album, Seeger said he wished it was "more serious".